Save for a couple of apps and celebrity appointments to company executive positions, the company formerly known as Research In Motion delivered pretty much exactly what we expected today. BlackBerry 10 is ready for prime time and the new and very modern-looking operating system has two shiny new pieces of hardware to support it – the all touch screen Z10 and the physical keyboard Q10 that many BlackBerry loyalists will be pleased with. We saw the big OS features that were previewed with the alpha software – the unified messaging Hub, the Flow navigation that delivers details without the need for opening apps, a touch screen keyboard that features a predictive typing method that you can use with one thumb. But there are some bigger questions about the future of BlackBerry that remain up in the air – some pondered long before today’s launch event and some raised by it. Not yet yielding on its insistent push to win over more consumer users, BlackBerry announced that it was naming recording artist Alicia Keys as its global creative director. It was the most surprising announcement made yesterday bar far and after the wow moment has left us scratching our heads. What’s not clear at this point is if this is just more of an attention grabbing ploy. Much like a university hands out honorary degrees to luminaries that it wants to be associated with, has BlackBerry now created honorary executive positions? Or perhaps Keys will be taking an active role at the company, helping set creative direction and capture consumer excitement. We’ll see how the singer does handling questions from technology journalists rather than entertainment reporter soon enough. 2. 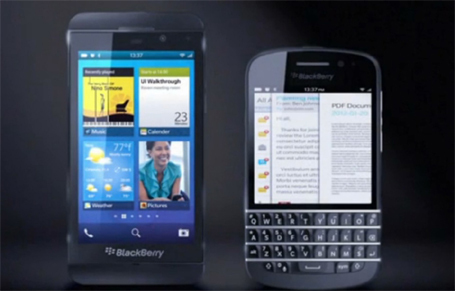 Will BlackBerry 10 be licenced to other manufacturers? In recent interviews, Heins didn’t rule out licencing BlackBerry 10 to other mobile device makers. There have also been acquisition rumours swirling around BlackBerry/RIM since its stock price began a rapid downhill slide in early 2011. Lenovo was the firm most recently speculated to be a suitor, and Heins has also said selling BlackBerry’s hardware business remains an option. Another rumour being passed around mobile analysts is that Samsung will licence BlackBerry 10, giving it more clout in the smartphone battle against Apple. Samsung has won its sizable market share be releasing compelling Android-based devices and broadening to a new OS not sold my HTC, Sony, or Motorola could be a real edge. 3. What does the rebranding to BlackBerry say about the company’s direction? Some signs of the rebranding could have been read like tea leaves by a skilled technology prognosticator. I was attending IBM Connect in Orlando and BlackBerry – not RIM – had its logo and brand emblazoned everywhere as a platinum sponsor. Those who got Z10 handsets early could have noticed the words “Research In Motion” don’t appear anywhere on the device. Yet the announcement of the rebranding of the company name, complete with new stock symbol, surprised everyone. In many ways, the move makes sense. Many refer to RIM as “BlackBerry” already, paying heed to the product that made the firm famous. Aligning product and corporate image under one brand should simplify marketing efforts and strengthen the handset’s brand. But does the distancing from the “Research In Motion” name that co-founders Jim Balsillie and Mike Lazaridis created signal some other strategic shift? RIM is dead, but not at all in the way we expected.